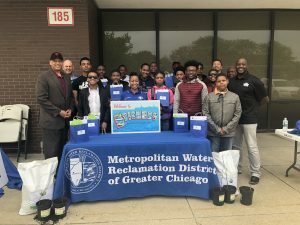 CHICAGO – Metropolitan Water Reclamation District of Greater Chicago Commissioner Kari K. Steele and 100 Black Men Chicago, Inc. come together to provide Chicago area youth Mentees of 100 Black Men Chicago, Inc. (ages 13-18) with an extraordinary opportunity to learn how the Metropolitan Water Reclamation District of Greater Chicago (MWRD) recovers resources and transform water at their fascinating and vital Water Reclamation Plants (WRPs). 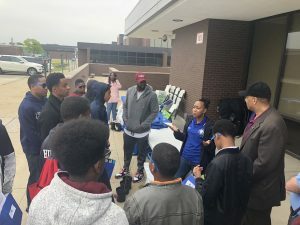 100 Black Men Chicago, Inc. Board President Carl Tutt accompanied the South Side Academy Site group of Mentors and Mentees during the tour on Saturday, May 19, 2018 between 9 a.m. – 12:00 p.m. The tour included a video presentation, Water Reclamation Plant (WRP) tour, informational brochures and a candid discussion with Commissioner Kari K. Steele about their future career goals and MWRD. All visitors were also provided free MWRD EQ compost and tree saplings. “As MWRD Commissioner, serving as the only chemist on the nine member board, I have made it one of my many goals to reach out to youth and introduce them to the fascinating work done at MWRD. This gives them the opportunity to see first-hand how S.T.E.M. (Science, Technology, Engineering and Mathematics) can work together in one place to accomplish extraordinary goals. At ages 13-18, it’s not too early for youth to start planning their future career goals and S.T.E.M. careers are great options to include in the planning. I’m grateful to 100 Black Men Chicago, Inc. Board President Carl Tutt for accepting the invitation and his team of Mentoring Professionals who organized their Mentees to make the MWRD tour possible,” said MWRD Commissioner Kari K. Steele. “We welcome opportunities to engage our Mentees with new ideas, concepts, organizations and companies that assist our efforts to expand their opportunities for success. The invitation from MWRD Commissioner Steele to participate in the MWRD Open House proved to be amongst the most unique experiences ever had by our Mentees. They were intrigued and excited to learn about Chicago waterways. It was a truly fascinating experience for all of us,” said Carl Tutt, 100 Black Men Chicago, Inc. Board President. The MWRD protects the health and safety of the public in its service area, protect the quality of the water supply (Lake Michigan), improve the quality of water in watercourses in its service area, protect businesses and homes from flood damages, and manage water as a vital resource for its service area. The District’s service area is 883.5 square miles of Cook County, Illinois. The District is committed to achieving the highest standards of excellence in fulfilling its mission. The mission of 100 Black Men Chicago, Inc. is to improve the quality of life and enhance the educational opportunities of African-American males throughout the Greater Chicago area by pairing them with successful African-American professionals committed to the intellectual development of youth and the economic empowerment of the African-American community based on the following principles: Respect for family, Spirituality, Justice and Integrity. For more information on 100 Black Men Chicago, Inc. and how you can get involved visit www.100bmc.org. To find out more about MWRD programs, services and career opportunities visit www.mwrd.org. For more information about MWRD Commissioner Kari K. Steele “Like” her Facebook Page at Commissioner Kari K. Steele; “Follow” on Twitter and Instagram @CommKSteele; and “Connect” on LinkedIn at Commissioner Kari Steele. In addition, feel free to reach out to her office at (312) 751-5694 with any questions or to discuss issues that are important to you.